Yonder comes the boat of Woods and Beach, the two solitary dwellers of this region. It is rather a singular coincidence that the only two inhabitants of this wilderness should be named Woods and Beach. I should not wonder if the next comers should be called ‘Hemlock’ and ‘Pine’. Beach and Wood’s presence on Indian Point literally put Raquette Lake on the map. 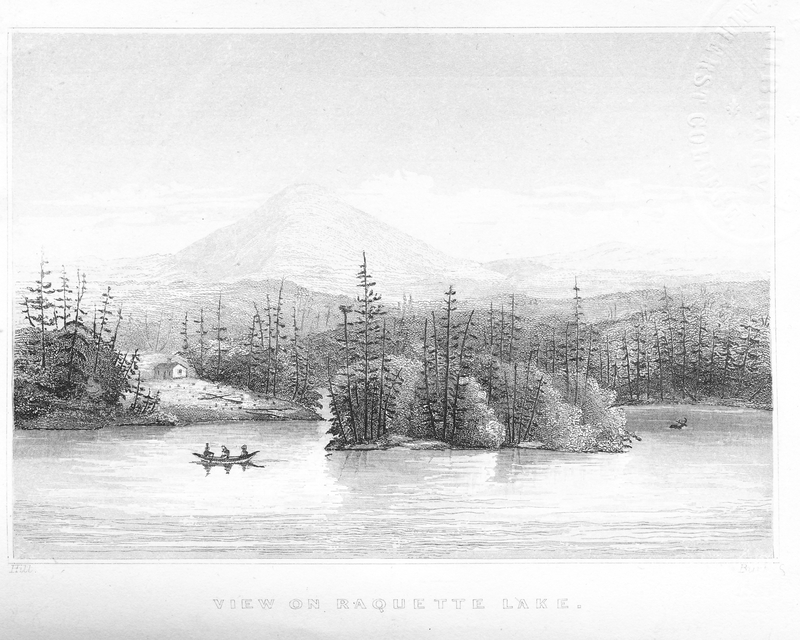 A fact revealed by one of the earliest depictions of Raquette Lake in J. H. Young’s 1845 map of New York State. The map shows an almost wholly inaccurate depiction of an un-named Raquette Lake, to the southwest of Long Lake. However, it contains a nearly accurate rendering of Indian Point prominently jutting out from the west side of the lake. Indian Point was the focal point of the first map of Raquette Lake because Beach and Wood were the center of hospitality for the earliest adventurers travelling through the region. Professor Ebenezer Emmons in 1840, John Todd in 1843, Joel Tyler Headley in 1844-1846. The tales told by these writers and the early surveys drawn by them undoubtedly contributed to this depiction of Indian Point on the 1845 map. Our knowledge of Beach and Wood come from the writings of these and later prestigious visitors. I have yet to find any photographs of Beach and Wood. However, a vivid picture of each is drawn from the writings of their visitors. 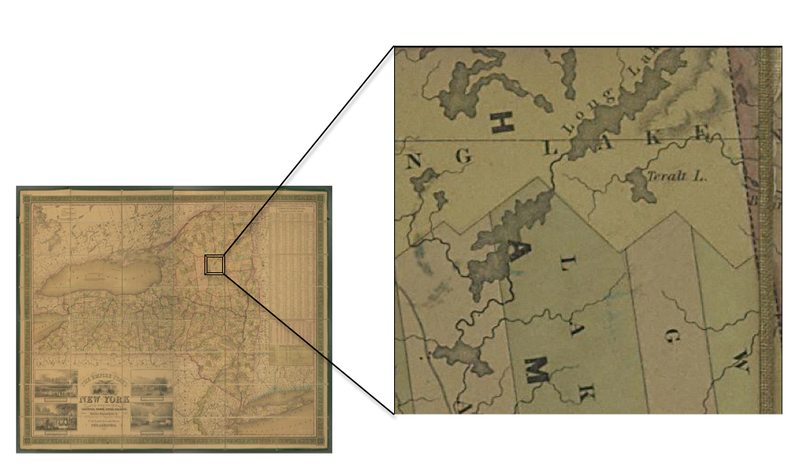 References to William Wood in the region, place him living with two other bachelors in a house at Herreshoff settlement to the west of Old Forge in 1832. Wood was a witness to the 1833 infamous murder of an Indian named Drid by Nat Foster (a story for another time). 7 At this early date, Wood was a whole man, given that court testimony during Nat Foster’s trial make no reference to the unusual physique and manner of mobility noted in later histories of the man. The year of Wood’s accident is a mystery. The historian Edith Pilcher claims the accident occurred when Wood fell into the Independence River while returning to his home near Old Forge. Pilcher attributes his survival to being found half-frozen by the very same Nat Foster, whose life Wood had perhaps spared with his evasive testimony during Foster’s murder trial. Local Indian friends of Wood are said to have amputated his legs and nursed him back to health. 10 Given he was whole at the time of the Nat Foster-Drid incident, Wood’s misfortune must have occurred after 1833. The absence of Beach’s character in these stories leads me to conclude that this tragedy befell Wood prior to their joint residence on Indian Point. The exact year of Beach and Wood’s arrival on Indian Point is also unknown, but it appears to have been between 1835 and 1839. The 1843 Constable family trip described in The Spirit of the Times mentions the “two old hunters who had lived here about eight years” –meaning 1835. Joel Tyler Headley wrote extensively of his 1846 visit with Beach and Wood stating “the two hunters that occupy [two huts] the only inhabitants that are or have been on the shore for the last nine years.” This would correspond to 1837. Stillman in 1855 states that “Mr. Beach has lived here seventeen years”, fixing 1838 as the date. At the second-ever town meeting of Long Lake in 1839, William Wood was elected Assessor and Matthew Beach was elected Commissioner of Common Schools. 11 It is likely that the two were then living together on Indian Point. Therefore, I believe Wood’s accident occurred sometime between 1833 and 1838. In 1840, Prof. Ebenezer Emmons and J. W. Hill stayed with Beach and Wood in their hut while surveying the Raquette Lake region for the Survey of the Second Geological District of New York State. 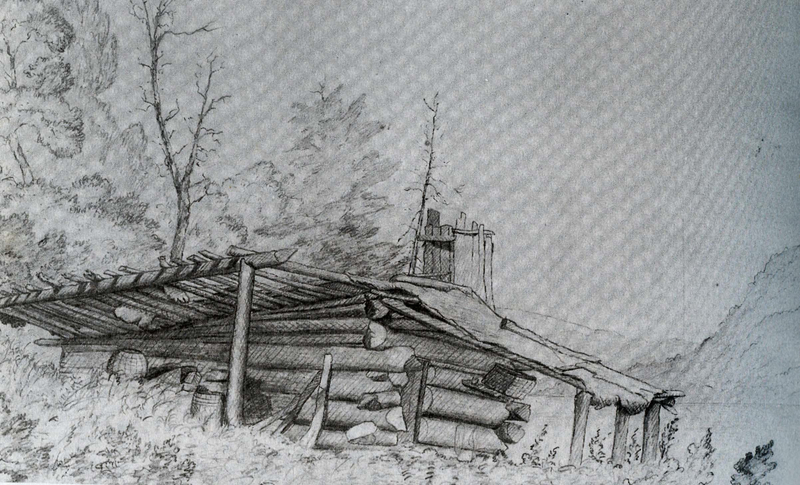 12 During this survey, Hill drew a sketch of their hut that was later published in Headley’s book. 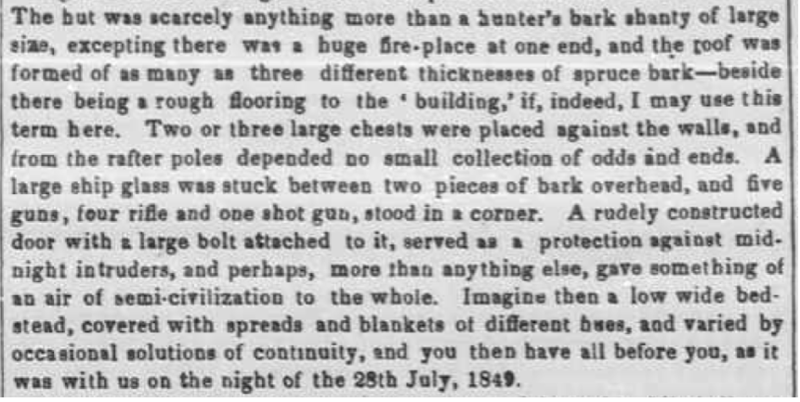 Contemporary newspaper articles write of Beach and Wood hunting wolves, deer and moose. In The Mammals of the Adirondack Region, a story appears told by John Constable of Wood “trapping a very large beaver in the fall of 1837, in a pond northwest of Indian Point on the Raquette. Wood carried his boat to the pond and paddled twice around it, searching carefully for signs, without going ashore. At last he discovered fur upon the root of an old birch that projected into the water. Here he placed the trap, attached to a float, and on the second day found the beaver in it.” 13 This was noted, at the time, to be one of the few remaining beavers in the Central Adirondacks. When the snow is five feet deep on the level, and the ice three and four feet thick on the lake, and not the sign of a human footstep any where to be seen, the smoke of their cabin rises in the frosty air like a column in the desert—enhancing instead of relieving the solitude. The pitch pine supplies the place of candles, and the deep red light from their humble window, at night, must present a singular contrast with the rude waste of snow, and the leafless forest around them. Their leisure hours they spend in preparing the furs they have taken, and in tanning the deer skins, of which they make mittens…When a quantity of these mittens are made up, Beach straps on his snow shoes, and with his trusty rifle in his hand, carries them out to the settlements. Reading of these exploits brings back childhood memories of watching Grizzly Adams on TV, but they did not subsist on hunting, fishing, and trapping alone. What truly astounds me is that they cleared a ten-acre farm on Indian Point. I observed quite a respectable garden on the west side of the hut, in which were some 18 or 20 currant bushes, laden with their ripened fruit, interspersed with red raspberry bushes and wild cherry trees—besides cabbages and potatoes in a flourishing condition. On the other side of the hut, towards the lake, was a little patch containing pea vines, then in blossom. found a comfortable house, with cattle grazing around, and an enclosure in which a few flowers and some vegetables were growing. There were tomatoes not yet ripe, beets, cabbage, and in the field outside, a scattered growth of turnips of immense size. I pulled up one, a flat, white turnip of the common kind, which measured 24 ½ inches round, and weighed five pounds. The luxuriance of the soil seemed wonderful—the ‘herd’s grass’ stood, on the shore of the lake where the clearing was old, six feet high. Although they both shared Indian Point, they did not always live together according to Raymond. He [Wood] and Beach in course of time disagreed, for in any part of the earth, no matter how secluded, two persons are enough for a quarrel; and a clearing of ten acres, even in a wilderness a hundred miles through, affords ground enough for a local dissention. So finding they could no longer live together, they agreed to divide their fortunes and have nothing to do with each other. Just when this disagreement and separation took place is a puzzle. I suspect that the separation occurred between 1844 and 1846. We know that John Todd found them living together in 1843. 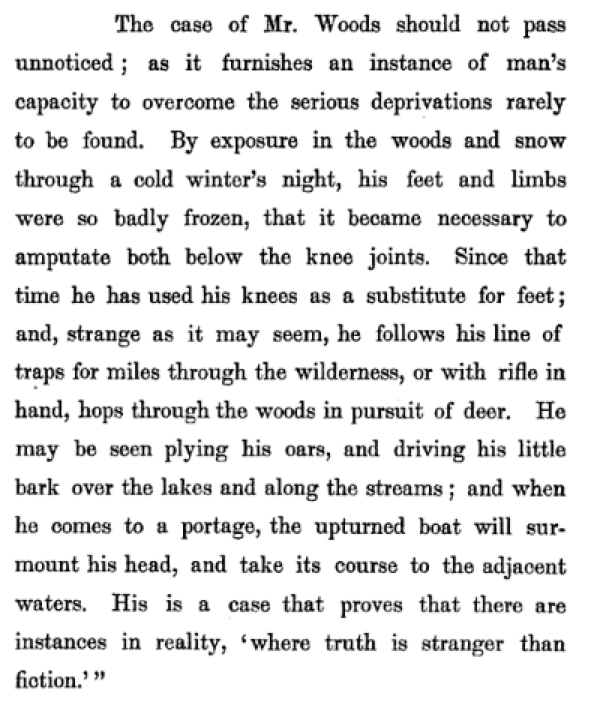 Headley’s writings from 1844-1846 are contradictory; one letter speaks of two huts while another describes a winter scene shared together in one cabin. 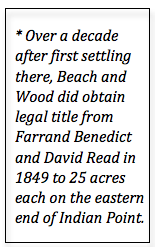 David Read’s letter of 1849 clearly uses the plural “dwellings” and C. W. Webber’s 1849 visit makes no mention of Wood and finds Beach living with a man of 38 who Webber describes as a “rather tall and thin figure”, most undoubtedly not Wood. The best description of William Wood’s separate cabin comes from the diary of James McEntee, who visited in 1851. Courtesy of the Adirondack Museum. This entry was tagged Adirondacks, Indian Point, maps, Matthew Beach, Raquette Lake, William Wood. Bookmark the permalink.